• In different materials excepting very hard or very soft materials like rubber, polythene etc. (i) The head containing electric motor,V-pulleys and V-belt which transmit rotary motion to the drill spindle at a number of speeds. (ii) Spindle is made up of alloy steel. It rotates as well as moves up and down in a sleeve. A pinion engages a rack fixed onto the sleeve to provide vertical up and down motion of the spindle and hence the drill so that the same can be fed into the workpiece or withdrawn from it while drilling. Spindle speed or the drill speed is changed with the help of V-belt and V-step-pulleys. Larger drilling machines are having gear boxes for the said purpose. (iii) Drill chuck is held at the end of the drill spindle and in turn it holds the drill bit. 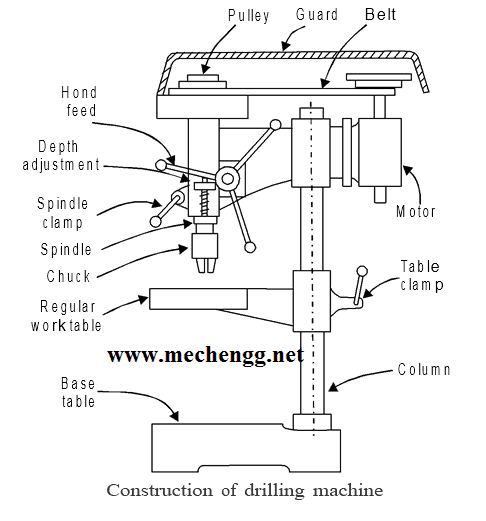 (iv) Adjustable work piece table is supported on the column of the drilling machine. It can be moved both vertically and horizontally. Tables are generally having slots so that the vise or the workpiece can be securely held on it. (v) Base table is a heavy casting and it supports the drill press structure. The base supports the column, which in turn, supports the table, head etc. (vi) Column is a vertical round or box section which rests on the base and supports the head and the table. The round column may have rack teeth cut on it so that the table can be raised or lowered depending upon the workpiece requirements. This machine consists of following parts. How Drilling Machines are Classified ? 7. Floor space required, etc. • Counterboring, countersinking, chamfering or combination using suitable tools.